One of the things I loved most about being a teacher was that moment when a child realized he or she was reading. The light that dawned in their eyes rivalled any sunrise, and I swear pride made them walk taller. I don't actually remember learning to read myself, although my mother told me I could read before I went to school. What I do remember is the night I first understood that my son could read independently. As a single working parent, most nights all I craved was SLEEP. If my son had had a nap at the babysitters, he was ready to party. One night I was lying next to him, reading aloud from the umpteenth book. After tunnel ball practice that day, my arms were sick of being vertical, so I handed him the book to hold. He took it and matter-of-factly continued reading the story aloud. Flabbergasted, I demanded, "Why didn't you tell me you could read?" He just blinked, and explained, "But you always hold the book." Gift them with your time. 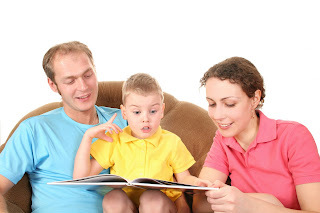 Having your undivided attention will make any reading time special for your children. Ignore the laundry, the washing up, the latest episode of Idol. One-on-one time spent reading aloud will pay dividends far greater than clean clothes, crockery or some fly-by-night celebrity. Reading with your kids is an investment in their future. "I love how you're trying different kinds of books from the library." "That was great when you used a funny voice for the duck!" "I was so proud when your teacher told me you talked about our read-aloud book in show and tell." Gift them with your own interest in sharing stories. Show your kids you love to read, listen to, participate in stories. Model love of reading by taking time to read when your kids can see you immersed in print. Also, there are so many wonderful literature-related events you can try. Story-telling at your local library, a puppet show about a folktale, a movie based on a book, a fairy-tale brought to life by a local theatre group - outings like these will make special memories, and reinforce the fact that reading-related activities are of high importance to your family. There is no one guaranteed way to teach a child to read. If we parents encourage our kids rather than forcing them, if we use a range of strategies like reading aloud regularly, modelling reading ourselves, praising, and investing our time, I believe we are setting their feet on the pathway to a life-long source of education and pleasure. Then they can hold the books for us!